Time has run away with me as happens so often…I will try to catch up. 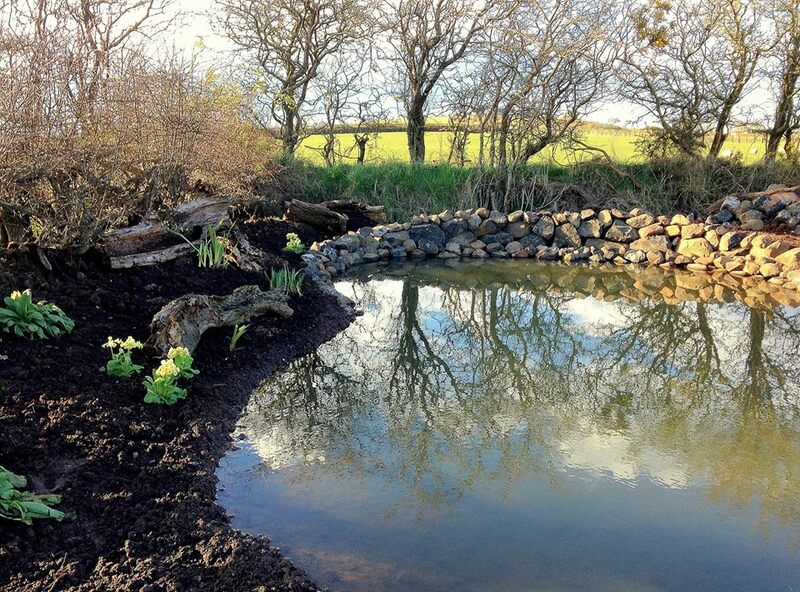 Since early March, we have been busy and the new pond is finally finished. We ended up having to use a liner as the soil was surprisingly sandy when we started to dig. The pond is essentially for wildlife and so we placed some of our clay soil on top of the liner, made the pond quite shallow with a gradual gradient all around. The stone wall at the back faces south and I’m desperately hoping to attract newts. Just beside the pond edge: Variegated flag iris, iris Gerald Darby, cowslips, geranium maculatum, water forget-me-not. Behind the pond wall: lythrum salicaria Rosy Gem, aruncus dioicus and japanese astilbe. In the pond: Caltha palustris, iris lasvigata, nuphar lutea, ranunculus lingua. I have scattered local wildflower seed on the bare soil on the wild side beside the existing meadow, we still have a stone seat to make overlooking the pond. Gardeners may need patience but I’m willing to bet this time next year, the pond will look as if it’s been there forever…..and hopefully the wildlife will approve!